Last year an editor from Parents magazine contacted me and said they wanted me to rewrite one of my blogs for them. What a thrill! It finally came out in this September's Back to School issue. Back to School issue! That's the best and fattest issue. Guys, it's an honor on top of an honor. If you read it--and I hope you do--I just want to clarify that #28 was supposed to be "Don't allow the word weenis in your home." But they changed it to wienies. Maybe they had never heard of the word weenis. Well I have. And I don't like it. I have no problem with wienies. I mean, I can take them or leave them. But whatever. Artists like me have to get used to this kind of stuff. I just hope my soul doesn't die from it. I am working on another article for Parents now. You may recall how I'm obsessed with other people's housekeeping styles and schedules. They've got me trying out four different housekeeping books and reporting on them. For example, one of them is a "green" approach. I don't want to scoop myself, but I will say that I've converted to cleaning with vinegar. That's all I'm going to say. Ever since Parents published my article I've been a lot less interested in reading magazines. I guess its because if they are written by people like me then I'm not interested anymore. I don't care what I have to say. It's kind of sad because I used to really enjoy magazines. Oh well. Wow! I'm happy for you AND jealous all at the same time. But you totally deserve it because I still remember that post. And I, too, would like to state that I am okay with wienies. That is so cool! Congrats. And I'll be rushing out to get my copy today. I remember that post...it's a good one. But I prefer weenis to weinies. Congratulations! It is too bad that you can't get a copy of the magazine yet (have them send you several). I know how you feel. I remember when I got my Ph.D. I immediately knew that it was a sham: if they were giving one to me and some of the other people I knew, then it wasn't that big a deal after all. That is AMAZING! And well deserved. I will have to pick up an issue. But how cool would that have been if I was sitting in my OB/GYN office waiting room flipping through magazines and then saw your byline!? I could turn to the woman next to me and say, "I know her! Well - I know her online...though blogs, I mean...do you know what a 'blog' is?...okay, nevermind. Enjoy your Newsweek article (snore)." Congrats! I happen to be a Parents Magazine subscriber and I have that issue on my bedside table. I will definitely read your article first! That is so awesome Kaci! Seriously very excited for you. And looking forward to reading the article! I totally agree with you about weenis. My husband calls his parents' dog Otis, "Otis Ween," and it bugs me. I said, "Why do you call him "Otis Ween"? to which Jason replied, "because he likes to lick his weenis. Duh." It's the worst. oh come on, who doesn't love the word "weenis"? okay, i don't. but my brother in law matt has a friend whose route y password was "weenis" and IT/honor code/someone at byu contacted him and told him that he needed to change his password. I actually got the magazine in the mail last week and looked for your blog. I was having a bad mommy day and your article made my day so much better! Oh my gosh - that is so exciting! I am totally going to go find that magazine and read your article! Congrats! See - I told you - you would be a great columnist. I loved your article in Parents Mag! And now I've found your blog, which is great too. Is the list from the mag posted somewhere online so I can share it with my friends who are not Parents Magazine subscribers? You mention that it's a reprint from your blog, but I can't find that entry. Well. I am not excited for you at ALL. I am just JEALOUS. JEALOUS. JEALOUS. I'm so impressed! I just misread someone else's comment to say, "See, I told you - you would be a great communist." I thought, "That's a little weird, but she IS published . . . so she's probably good at lots of things." I think you should teach at BYU again. Just think of the street cred this gives you. Not to mention me, because we sort of have the same hair. Hey, I read your article while I got an oil change today. I didn't realize it was yours until I came to your blog. Very cool! There was one I wanted to ask you about, but now I don't remember the statement. I think it was the very last item. Congrats on your article. However, #25 is untrue and offensive to many of us. What gives with attacking clogging lessons? Clogging is fun and helpful. I personally teach over 200 students and teach clogging at a University. It really has incredible benefits and has been one of the best things for many of us. Not sure your intention to knock clogging? Just found your blog after thoroughly enjoying your Parents' article. Way to go! That was a GREAT article!!! So glad I got a copy of it! Go Kacy! I am going to buy the magazine and run all over my little town bragging that I know you. You're awesome. I happened to just quote your article on my blog, not knowing you were LDS or also connected to Gabby (I used to live in NY with her). HI-LAR-I-OUS. I'm glad to have been referred to your blogs. Hooray for some real mom advice. Congratulations! I just read the article and loved it. I was giggling through it because it is all so very true. I wish they had the article online so I could share it. Just wanted you to know, I read and loved your article in Parents, much more than most of the falsely ambitious mothering articles. I even recommended it to a friend before I discovered the many joint friends you and I have, which really makes me wonder if I actually knew you once upon a BYU. But anyway, thank you for a great article. holy load of comments batman. 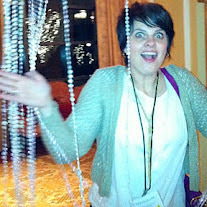 I found your blog once again through Mrs. Stephanie Manwaring's blog. And it's ironic to me that this is the most recent post. do I get to feel special because it was I who mentioned it to you on FB or did someone mention it to you first? haha. JK. sweet article. I need to show it to my sisters. they'll laugh their heads off. We've all got a bunch of kids so we know how it goes. oh and I almost DID steal that magazine from my dr. I just learned about you from your Parents article - which I absoltely loved!!! 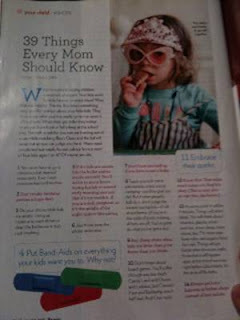 I too blogged about it because it has been one of my favorite articles in Parents Magazine in a long time. It was so refreshing and the best advice ever. You are so very wise! And you are a great writer. I hope Parents Magazine uses you again because you have the most pragmatic advice for moms. I also share one of your tips (I thought I was the only one) - that you should only use duvet covers! I have always wondered why more households use this method! Ok, I know this is an oldish post and you don't even know me. And I don't even subscribe to Parent's magazine...BUT my daugter does get weekly therapy. The physical kind, though she probably will eventually need the mental kind due to her kooky mother, but anywho...while waiting for her I read the magazines that I am to cheap to subscribe to and I actually remember reading this and laughing. And I remember thinking how true it was and how I wish they had more funny stuff in those magazines instead of the guilt or stress inducing kind. So, pat yourself on the back. It was really great. And Merry Christmas from Iowa.